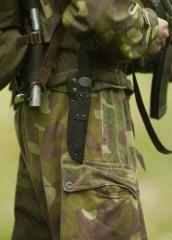 A very simple and rugged military knife from Finland. No Rambo/"survival" stuff here - this is meant for real use. The Sissipuukko (best translation would probably be "Ranger knife") is familiar to most Finns who've been through national service, where these see widespread use as personal purchases, mostly by NCO's and such. Unlike most military knives, this is actually fairly useful for other things beside stabbing your fellow man. We can say from experience for anything else than elaborate miniature wood carvings, the Sissipuukko will suffice. 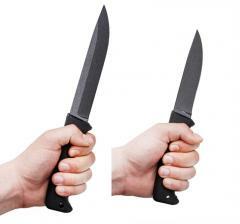 The knife is made of HRC58 carbon steel with a teflon coating, with a very sturdy, hard rubber handle. As the blade is not serrated and very simple in design, it is easy to sharpen and keeps an edge surprisingly well, depending, of course, on how you use it. M/95: The longer model. Blade length 15 cm, total length 28 cm. M/07: The shorter model. Blade length 12,5 cm, total length 25,5 cm. Blade thickness 5 mm for both. 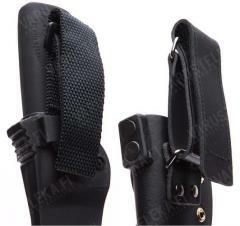 Leather sheath: Made of about 3 mm thick black leather, with a nylon belt loop with velcro closure. On the other side the sheath features a leather loop for fastening it to webbing, or anything else with a proper strap, like the belt loop supplied. Plastic sheath: Attachment loops for the nylon belt loop on both sides, making this piece of kit ambidextrous. Can be fastened to stuff using the 3 cm wide loop and either a suitable strap or the belt loop supplied. Can also be secured with a piece of string run through the small hole in the tip of the sheath. We got both lengths with the leather sheath, but only the longer model with plastic sheath. However, the shorter knife will fit into the plastic sheath. The model is designed by J-P Peltonen, and the knives are made in cooperation with Fiskars. These are manufactured in Finland, so you can rely on the quality - these are held in high regard by just about everybody who knows something about knives. Mulla on ollut tällainen vuodesta 2001. Armeija-aikoina herätti kateutta tovereissa ja sen jälkeen palveli uskollisesti partioleireillä. Nuotio syttyy mukavasti kun pistää klapit sellaisiksi lyijykynän paksuiksi tikuiksi. Partioleireillä iso musta puukko kiinnosti kovin pikkumiehiä, mutta antaa räplätä vaan, puukko pysyy tiukasti tupessaa. Varsinkaan alaviistosta pikku ryökäle ei saa sitä vietyä. I own an older version of the M07 knife (the flat grind version) and I have been using it continuously for over a year now. I camp or bushcraft about 6 months in every year as I live on a touring bike so I get a lot of good usage from my blades/axes/saws etc. The knife itself is very well made, the steel, (80VrC2, the same as the Terävä knives), is excellent, very sharp and easy to put an edge back on it, in fact, it has become my single favorite knife steel. The non-stick coating (teflon-esque stuff) works perfectly, it doesn't flake off in anyway and very little sticks to it. The knife shape itself works for everything, a time tested design, it will work for you, no worries there. The handle is dense, comfortable and ever so slightly soft to the touch. Its easy to grip in both the wet and the dry. 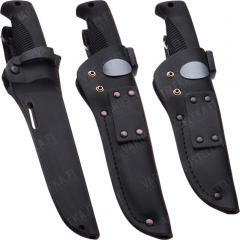 The sheath is ingeniously designed, very well made and holds the knife very tightly. This knife can compete with any carbon steel blade on the market. An excellent buy. Korvaa kohta leukun vyöltä...koska huono tuppi siihen, niin ei pääse vyölle, vaan repun kylkeen. Pidempi teräinen sopii kaikkeen, puiden pilkkomiseen ja hirvihommiin, kalatkin saa käsiteltyä pannulle. Lyhyempää en ole vielä hirveesti ulkoiluttanut. Molempia tuppimalleja yrittänyt käyttää, kumpaakaan ymmärtämättä. Repun kyljessä menee molemmilla. Salaisuutena terässä sen kylkien kiilamaisuus, jonka vain Marttiini aikanaan ymmärsi ja hekin jo sen unohtaneet.. kahvassa pitävä ja tiivis materiaali on nykyaikaa, samoin pinnoitus. Vain parhaita ominaisuuksia niputettuna. Kuka vielä tekis "siviilitupen" tälle? I have the newer version of the M07 (not from you guys BTW, they were very difficult to find in stock anywhere). It's a very good knife, on a par with the Terävä Jääkäripuukkos. Let's be honest, the JP is the knife Varusteleka designed to offer a similar knife to the Peltonen which was always out of stock - and you did a very good job. So well that Peltonen ended his cooperation with Fiskars and shifted the production of his knife blades to Laurin Metalli, the same who make the Terävä knives. The Peltonen Sissipuukko and the Jääkäripuukko are obviously made from the same blade stock - 80CrV2, same width, same thickness. Thus, excellent steel. The Peltonen Sissipuukko has a different profile, with a higher grind and a thinner tip, more suitable for either cutting cheese or stabbing something or someone. The Jaeger knives from Varusteleka are a bit more hard-use bushcraft/outdoor tools, the Peltonen has a bit more military dagger DNA in it, you feel more 'armed' when you carry it. The teflon(ish) coating works very well, the handle is fine and the sheath, well, the sheath... It's original, the retention wheel works but I think it's fiddly and I had to sand down the hand guard on my knife's handle several mms to make it easy enough to sheath and unsheath it without using excessive force. I like the Terävä sheaths a lot better. The Peltonen sheath also has a typical traditional puukko insert - that is, not entirely enveloping the blade but just protecting the cutting edge. The spine is unprotected, and the sheath being rather tight (short) for the knife, I once cut myself when the blade punctured the leather while using a lot of force sheathing it, and the tip went right through and cut me in the palm of my left hand that held the sheath. After my little modification of the handle, that has not happened since as I no longer need so much force to sheath it that I really need to push back hard with my left hand, but it shows that the sheath, although original and good looking, is not perfect - it could protect the blade and the wearer better (that is why I have 4.5 stars and not 5). I also reworked the secondary bevel on the blade into a convex edge, as the original edge bevel was a bit too fragile for my taste - now it's really good. Also note that the Peltonen has no sharp spine for scraping, you would need to file it off and damage the teflon coating (I don't use a firesteel much, but I like the long straight sharp spine on the Terävä for all sorts of scraping tasks, I think it's a good functionality to have on a knife). Just received and did some quick cuts. It i very sharp and feels sturdy. The sheath also feels good. I am most happy about the simple design, in north America we have a lot of knife makers pumping out overly aggressive "survival knives" which are not practical, Finland to the rescue. The pictured belt loop configuration for the plastic sheath does not seem right to me. I basically inverted the orientation so where the belt rides at the very top of the loop and pinches the velcro closed between the belt and the hip. Even with the teflon coating it was able to throw spark off a fero rod as well so that's a nice bonus.